Recently I reviewed The Artist's Guide by Jackie Battenfield. 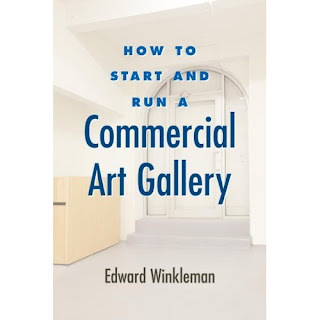 Now in a lovely bit of publishing symmetry, there's a dealer's guide, How To Start and Run a Commercial Gallery by Edward Winkleman, about to be released by Allworth Press. Ed has a gallery in Chelsea. He's also a widely read blogger, which you probably know already even if you haven’t been to his gallery. Ed's blog attracts an assortment of artists, dealers, collectors and critics who come in all degrees of intellect, anger, creativity, bitterness and kindness—in other words, an art world in miniature. His online generosity has flowed into his book, which in turn has flowed out of his experience as a respected New York art dealer. While the book's intended purpose is to help a potential dealer understand how to start and run a commercial gallery, it also provides artists with a clear look at what goes on behind the scenes. For one thing, understanding the dealer's concerns and activities will help you present yourself in a way that complements the gallery's program. For another, it underscores the idea that artists and dealers are not so different. Here's Ed: "This is a business in which very little is stable . . . rent in your neighborhood will skyrocket, forcing you to find a new location (and consuming all the money that moving requires); and critics will inexplicably hate your latest exhibition. . . It never really gets easy. Some months you’re flush; others, you’re scrambling." Sound familiar? Identity and branding; pricing; contracts and legal issues; logistics like crating, shipping, framing; cash flow; and the art fairs are all covered in specific chapters. Independent artists will find the information eminently useful. Though the crashing economy will undoubtedly require second-edition revisions in the Art Fair chapter, it's edifying to see how closely the submission process for dealers to art fairs parallels that of artists to galleries. Ed talks about job titles and responsibilities. Wondering whom to send your materials to? He explains the hierarchy. But more than that, when he tells you what it takes to run a gallery, you can see it's almost the same as what it takes to run a studio. We make, the gallery sells. But we all share the same tasks: photographing work and archiving images, tracking inventory, maintaining records, PR, packing and shipping, bookkeeping. I particularly liked reading about how several New York galleries divide the workload with staffers. The smaller galleries take on multiple tasks, just like artists. The information here will help an unaffiliated artist create her own promotional strategy. Better still, extrapolating that information, once you follow a gallery and understand the way it presents itself to the art world, gives you a way to approach that gallery.
. . . . . In other words: show, show, show, show and network, network, network. This goes along with what I know of dealers. Their websites may say "No submissions accepted at this time," but they are always looking. As for cold-call submissions, they are, confirms Ed, "the least productive means of finding suitable artists." If you must go this route, do your homework. "Every now and then an unsolicited submission will make your day. Either the artist has done his research and knows his work is a good match for your mission, or fate smiles on you." Will reading this book automatically get you into a gallery? No. But it will give you insight into the gallery process. An artist who understands the system and is willing to do her homework to find the right matches and submit to the rigors of the process has a much greater chance of getting into a gallery she has targeted.--and equally, important, flourishing there. And here's the corollary to that: When the economy finally starts moving in the other direction, a new crop of passionate entrepreneurs will be poised to open their doors. Galleries need artists. This definitely looks like an interesting book for artists and dealers alike. Ed runs one of the most unique galleries in all of New York in that he has a clear vision about the work that he supports, so you know he really believes in the ideas of the artists that he represents. I think that the programming within a gallery is an often overlooked component of the success of both the artists and the Gallery. There are many interesting galleries operating today, but I find the most fascinating ones have a clear vision and a curatorial sense about the work they support. Take a gallery like Pavel Zoubok (collage aesthetic) or Stephen Haller (focus on texture and surface) for instance and you know where they are coming from with the work they support, you understand the context of the work. Contrast that with the infamous Agora Gallery and you begin to see that there is no clear vision for the work. In essence art becomes secondary to the commercial interests of the gallery. If you really believe in the work that you are producing why on earth would you place it in a schizophrenic context, where there is no clear vision for the collective work represented by the gallery? Hopefully this book forces more people to consider the complexities of the Gallery Artist relationship and consequently make better decisions about how to introduce their art to a commercial venue. A clear vision on the dealer's part is necessary for collectors, too, so that they can find the galleries that best speak to their interests. With hundreds of galleries in NYC alone, how does a collector find those dealers who show the kinds of work they most want to acquire? It all ties together. I'm sure I'll pick up the book in any case, but Joanne, does it offer much advice specifically aimed at collectors? Man! I really wanted this conversation to go somewhere, but it hasn't seemed to take hold. As a result of the market crash, I've heard a great deal of talk about a shift in the dynamics of the relationship between galleries and artists. The big wigs such as Keith Tyson and Damien Hirst have already ventured beyond the gallery, so now the discussion among other artists becomes-- do we really need galleries? How can we bypass the whole middleman and take art directly to an audience or a collector. I'm sure that galleries will continue to exist as long as art is being made, but it is interesting to think about how one can engage an audience or a collector beyond the confines of a traditional commercial gallery setting. Artists aren't selling drugs, why do we need a dealer? If you have any thoughts or opposing ideas, please jump in! I like what you are trying to get at. Although there are many reasons for artists to stay with dealers and unless we add salesperson to our list of skills it will never happen. In general we cringe at the idea of sales and it keeps us trapped letting someone else create the link. Even if artists go out and create their collectors it can be looked down upon as "selling out". An artist would have to unpeel many layers of teaching that started in school and redefine our goals as an artist. I wonder how did artist's create relationships with collectors at other times in history? How did it work in Peter Paul Ruben's day or how the did the salons worked in David's and Ingre day. Was there a middle man? Delucci, Glad you're stirring the pot. All of these options are viable. Done well they could give a reputable local or regional career. A dealer's job is to create a context and a market for my work. A dealer presents it to the art world via ads, openings and art fairs. A dealer is in a position to know and work with other dealers, to make sure my work is seen by curators and critics. Because of those relationship, my work has the potential to be exposed nationally and internationally. I first thought this information was wonderful about getting to know the dealer and why. As I read along, however, I could see the artist and his/her creation fading away into the business of art. How can an artist maintain their purity in this environment? If by purity you mean not having your art "tainted" by commerce, the answer is simple: Do not show in commercial galleries. Work another job 9 to 5, so that you can put that income into supporting yourself and your work. Then you can show in non-commercial venues, such as non-profits and academic galleries, where money does not change hands, and you will be able to afford to give away your work to those who love it, without the impure stain of money. When you die, your pure work will very likely be tossed into a dumpster by those who don't care a whit about it. But that's OK because you've maintainey your purity and you'll go to heaven. If that's your thesis, you haven't been reading Marketing Mondays, because the whole point of these columns is to better understand how to build and sustain a career in art. A career. Paying the bills by the fruit of your imagination and hard work. With art and purity the conversation seems to revolve around the notion that selling art is a form of prostitution (except you're not selling your body you are selling your soul!?). I for one don't buy into this prostitution theory of art and commerce. I think that a healthy exchange of cultural goods (art, music etc) is a crucial part of a highly functioning society. The gallery system arose out of the necessity to allow artists to reach an ever expanding audience in a post patron/court environment. In and of itself there is nothing impure or wrong with engaging in this structured exchange of art. I think the real concern about purity emerges when an artist or dealer alters their vision to cater to market concerns or trends. Depending on who you are this may be considered a wise career move, while others may cry "sell out". I am a practical realist, so I understand that all artists and dealers must operate with an awareness of the market, but I do think a bit of validity is lost if one begins to concern themselves disproportionately with monetary considerations over artistic concerns (process, growth, risk, vision, identity). With regard to an earlier post, I would have to answer that indeed there are too many "dime a dozen" artists, but there are too few artists who continue to pursue art with the depth and passion deserving of the term artist. Thanks for the kind words, but I am a painter first and foremost. As a collector, I value many venues for viewing art and selecting some pieces to purchase. Galleries are chief among those venues, followed by a couple art festivals and occasionally the internet. On the internet I go directly to the blogs or sites of individual artists and so far have found group art sites to be a waste of my time. Perhaps that will change as better quality standards improve for the groups. Without brilliant gallerist showing me works otherwise nearly invisible, my reach and collection would be smaller. After owning several pieces from a given artist, I treasure the personal relationships that develop and studio visits are priceless. I have never made a studio visit to an artist whose work wasn't already important to me. Maybe this is a good time for new small galleries to emerge with clear missions and specialties, plus the marketing savvy to find their customers in new ways. Found you by way of the "Mark" link and glad you mentioned Ebay in the comments - another venue to consider. Yes, I mentioned Ebay, but in relation or a local or regional career. I don't think big-city dealers are eager to take on an artist who has been selling online--and that includes via personal websites. And, to be honest, I don't blame them. What dealer would want to bve in competition with the very artists they represent?